The RMS Titanic is the most famous ship of the 20th century, sinking on its maiden voyage April 15, 1912, after striking an iceburg at 11:40 p.m. on April 14. At that time, RMS Titanic was the most luxurious and largest man-made moving object in the world, being 882 1/2 feet long and 92 feet wide. The White Star Line of England which constructed the Titanic was owned by the International Mercantile Marine Company which was a huge shipping trust formed in 1902 by J.P. Morgan of America. This historic document dated 1915 is in an ornate classic, antique gold, wood frame with gold leaf accent is approximately 14 1/4" x 18 1/4" and 1 3/4" wide. Color coordinated matting, clear glass, and acid free backing are included with this ready-to-hang frame. A brass plate engraved "Royal Mail Steamship Titanic" is included along with a copy of an authentic portrait of the Titanic by renowned artist E.D. Walker of England. Walker is the official artist of the RMS Titanic International Artifacts Exhibition which is currently on worldwide tour. 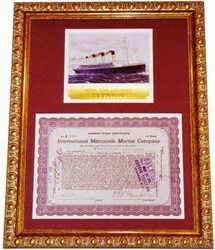 These framed certificates contain original signatures of the International Mercantile Marine Company's officers. Of particular interest is the signature of Philip A.S. Franklin who served as the American vice-president of IMM at the time of the Titanic's maiden voyage and sinking in 1912. Mr. Franklin was influential in persuading Bruce Ismay to remain in the U.S. upon his arrival with the other survivors on the Carpathia. Soon thereafter, Ismay cooperated with the U.S. Senate investigation of the sinking led by Senator William Alden Smith. Philip A.S. Franklin later became the American President of IMM. The actual item looks much better than the scan indicates.